Josh Hader- RP- MIL- Hot- Hader picked up his 5th save of the season yesterday, retiring all 8 batters he faced and striking out 3 of them. His save totals opportunities will possibly decrease when Jeremy Jeffress returns from a rehab assignment. Hader may also see his workload decrease some. He is on a pace to throw 116.2 IP this season. That would be a lot in this day and age, but he did have 81.1 IP last year, so the drop off may not be that drastic. With his 13 Ks Hader owns a 15.26 K/9. At worst he will probably lose some saves but gain in holds when Jeffress comes back, so in leagues that count holds the value impact will be minimal. Hader will still log above average IP, so those Ks can add up to almost a starter's worth in any given week. David Peralta- OF- ARI- Hot- Peralta has hit safely in all 10 games he has appeared in so far in 2019. His average of .413 is helped by a .486 BABIP, so some regression will be coming. Although Peralta has only hit 1 homer so far after a career-best 30 in 2018 he has been sustaining his Hard% of 48.6% in the early going, the exact same number he had last year. He also has seen his FB% stay very close to last year, falling only to 28.6% from 29.2%. This may make Peralta a buy low candidate if his owner starts thinking his 2018 numbers were a fluke. Jesse Winker- OF- CIN- Cold- Winker has only one hit on the year. That is due primarily to horrendous luck in the form of a BABIP of .059. Winker posted a .405 OBP in an injury-shortened 2018 with a 14.7 BB%. The lack of hits may have him pressing some as his Swing% has jumped form 40.8% in 2018 to 51.2%. Winker's BB% has dropped to 3.8%. If fortune doesn't turn for him he may find himself at AAA Louisville to get straightened out before too long. 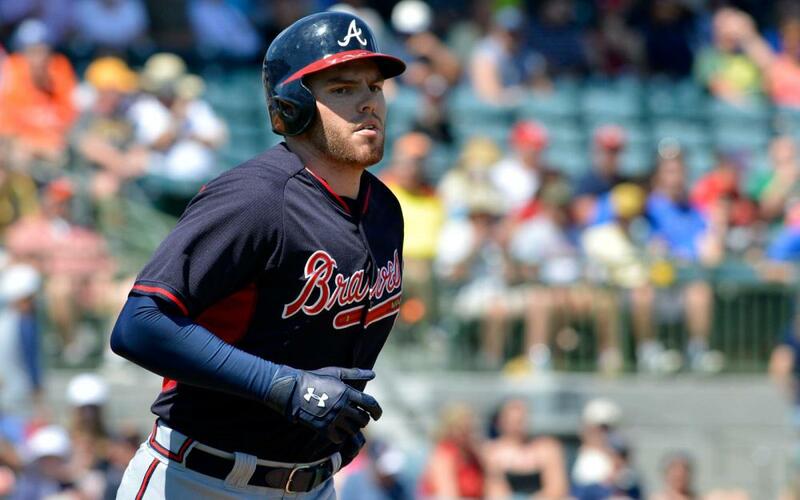 Freddie Freeman- 1B- ATL- Stats- Freeman hit his first homer of the season yesterday. He has enjoyed a .462 BABIP which has boosted his .419 average. Teams may be seriously pitching around Freeman in the early part of the season which could account in part for the lackluster power numbers. In 41 PAs, Freeman has drawn 10 walks, only 1 intentional, while striking out just 4 times. His BB% is a whopping 24.4%. Freeman's First Strike % has dropped from 60.3% in 2018 to 48.7% this year. Overall, his strikes seen has only dropped from 41.7% to 40.2% but pitchers are starting the count in the hole. The other possibility for the slow power start is Freeman may have effectively adjusted to the shift. When he puts the ball in play a huge 52.2% of them are going to the opposite field. Last year, it was only 25.8%. In 2018, only 23 players were shifted on more often than Freeman. He may be sacrificing some power at this point to exploit the defense against him. This would also have an impact on raising his BABIP. We'll have to keep watch to see how this plays out. Paul Sauberer is one of the original Fantistics Analysts. Paul is a diehard fantasy baseball fan with political aspirations. Paul's earliest baseball memories are of the expansion Senators in the 1960s and his father buying him an entire box of 1969 Topps baseball cards. The Senators are no longer and the cards are definitely no longer in mint condition, but Paul's love of baseball continues. He transferred allegiance to the Orioles after the Senators left town and enjoyed the glorious times of the Birds in the 1970s. During that time, he also discovered table top baseball games (before "Rotisserie" meant anything outside of something to do with food) and that has led to decades of crunching numbers and following major league performances. Paul reacquainted himself with the Senators, now the Texas Rangers, while going to college in Texas and remains a Rangers' fan today, even after living on Long Island for 14 years with his wife and two children. Paul knows his baseball!